I love sushi. I love it so much. I love everything about it. The fish, the rice, the nori, the little wad of wasabi, but as much as I love all of that, I love the pickled ginger, or gari, even more. Oh, pickled ginger, how do I love thee? Let me count the ways. You’re sweet and sour, spicy, fresh, snappy and PINK! * You pack so much punch into such a little package. *Pink. Sigh. I love pink. We look over the menu and order far too much sushi with the justification that we can take leftovers home to the children. When the sushi arrives, we each take an identical roll. He pours soy sauce over the bottom of his plate, drops his portion of the roll into it, piles it with wasabi then manoeuvers the whole thing to his mouth adeptly with chopsticks. I eat a piece of pickled ginger, put a couple dots of wasabi on my roll, dunk a corner in soy sauce, and dive in. We then repeat until we have to call for more pickled ginger and wasabi and the waitress gives us the stink eye. We call for a small box to house the one lonely California roll we managed to save for the children and waddle out of the restaurant clutching our overfilled bellies. We take a nap in the car then drive home. I know. The glamour and high-living we exhibit is stunning. It’s okay if you need a moment to process that. The pickled ginger, though. Mmmm. During each of my pregnancies, I craved it like other people crave ice cream. I ate it on everything from rice bowls to sandwiches. I sent my husband over to the Asian foods market across the street from his office to grab a new jar for me almost weekly. Then one day I looked at the ingredient list and saw two things I didn’t like; aspartame and food dye. I sent him back the next day to get me a different brand. He came home with a white pickled ginger. Still with the aspartame. Blech. 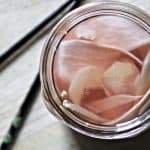 A little searching on the internet yielded a plethora of pickled ginger recipes for experimentation and an interesting tidbit of information about the pink connection for pickled ginger. 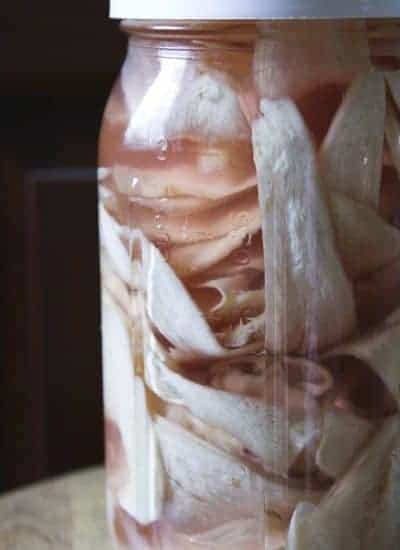 I learned that young ginger, the variety that yields the best pickled ginger, naturally turns a soft pink when pickled. Old ginger, on the other hand, may not. So I ask you, what gives on the food dye? While young ginger yielded the best texture and flavour, old ginger that was pickled also had a certain charm to it. Slice the ginger as thinly as is humanly possible. A mandolin or extra sharp knife and a dose of patience is your best bet. Slice across the ginger instead of slicing lengthwise. This yields an easier-to-chew result. To easily peel ginger, scrape the edge of a regular spoon over knobs of ginger. The skin should easily peel away. If it doesn’t, and you have to dig the skin away with the spoon, you have older ginger. Don’t be alarmed by the quantity yielded by this recipe. It keeps nearly forever in the refrigerator and -if you have friends that are like me- it makes a thoughtful and unique food gift. Snappy, spicy, sweet and sour, pickled ginger is not just for sushi. Serve with rice bowls or as a palate cleanser with seafood dishes. You'll be thrilled at how easy it is to make this classic Japanese condiment. Wash the ginger and use the edge of a spoon to gently scrape away the skin. Toss ginger slices with salt in a colander and leave over a bowl or the sink for one hour, tossing again occasionally. Lay the ginger slices out on a clean tea towel or paper towels to blot some of the excess moisture from them before putting them in a heat-proof jar or container that has a tight fitting lid. Bring the rice vinegar and sugar to a boil and pour immediately over the ginger. Put the lid on tightly and allow to cool completely at room temperature. Refrigerate for at least one week before serving. Stores indefinitely in the refrigerator. *You can test the age of the ginger in your store several ways. In young ginger, the skin should look smooth and tight. It should feel heavy for its size when lifted. If you scrape your thumbnail over the skin gently, it should peel away with little effort. You can pickled older ginger, but it may be a little chewier. 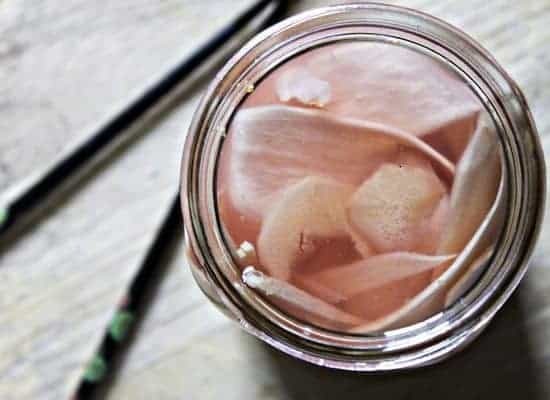 **Use granulated white sugar for the best looking pickled ginger. You can use raw sugar, but the pink colour will not be as pronounced and it may add a slight caramel flavour. Yum! Next we need a recipe for the seaweed salad that I can’t stay away from :). So how come the pictures show it sliced lengthwise and the recipe & instructions state explicitly not lengthwise? Once I figure that out, I think I’ll try it. You are soooo right! Pickles ginger is the answer to the world’s woes, but I never thought of making it myself. . .thanks for the recipe! Do you rinse any of the salt of? Do you rinse any of the salt off? How come when they make it in China they can’t resist putting something toxic in it like aspartame? Is it because aspartame use is part of the trade agreement with the US? Thanks for the recipe I will take my china made gari back to the store and get a refund. I can’t eat aspartame. I’ll be going on a LC Diet soon, could I use an artificial sweetner instead of the sugar? …. also: I don’t have much room in my refrigerator. With all that vinager, would this be suitable for waterbath canning? Silly question…can I put it into a mason jar? And just to clarify (because I’m new with many things in the kitchen!) 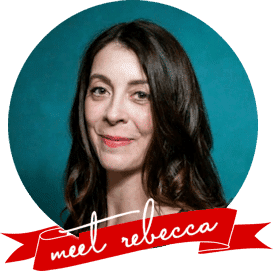 with any container you use, you always pour it in and put the lid on tight while hot, and you don’t refrigerate until it’s cooled to room temp? And finally, Is there anything unsafe about this if I mess it up a little? You can absolutely put it in a mason jar. I always do! And if you’re pouring it in while it’s hot, I’d definitely advise using a mason jar. Other types of containers (specifically plastic) aren’t built to hold up to the heat. I let it cool to room temperature before putting it in the refrigerator. And finally, you’ll be fine if you mess up a bit. This is a very forgiving recipe! Thanks for reading and thanks for asking! For pickled ginger can you use table salt? Hi Valerie- I did not test this recipe with the jarred ginger, so I’m afraid I don’t have advice for you on the subject. If you do try it, I’d love to know how it works out for you. Love your story, you are 100% correct !!! and I agree with the recipe. 2 thumbs up. Do you have to boil mason jars like with canning fruits and vegies? AND what IS THE BEST high quality rice wine vinegar? Hi Richard- I would advise that you boil the jars since you’re not processing this ginger! As for the BEST high quality rice wine vinegar, that’s definitely a matter of opinion! Boiling the jar has no practical use, other than heating the jar so it won’t crack when you fill it with boiling sugar+vinegar. The short boil of sugar and vinegar is only to disolve the sugar. Because, as it’s elsewhere noted, vinegar eats aluminum, and “stainless steel containers are (depending on the quality and country of manufacture), affected somewhat, definitely cook use minimal time in stainless steel pots and also store in glass jars. This ginger root is not cooked, and therefore contains bacteria and who knows what else on the surface, which by skinning slicing is now everywhere. Consider the fish tapeworm eggs which remain viable in raw, pickled fish. I’ve just talked myself into cooking the ginger! This home method is NOT canning, the primary preservatives is refrigeration. Vinegar (3% acetic acid), and Salt. Consider the example of pickles. Since I’m not going to let the big container of ginger stay uneaten very long, I’ll skip the salt for health reasons. and thanks for the vague warning about iodine and vinegar. Frankly, I do not see why it would be advantageous to tighten the canning jar lid before fully cool, I see no reason to create a 1 week anaerobiasis before opening the jar and starting to eat the ginger. If you use aspartame instead of the sugar to sweeten the ginger, boiling is not required, only stirring until disolved. You seem a little cranky, Nino. The “vague warning” about iodine and vinegar was pretty clear. Table salt doesn’t do well in canning in general, not just in the presence of vinegar. And as for it being raw, technically yes… but vinegar does chemically “cook” foods and is a pretty effective killer of parasites. As for aspartame, the reason I choose not to use it is that has been linked to some unpleasant side effects that I’d like to avoid. Since sugar does a lovely job of sweetening things, I don’t feel obliged to use aspartame. 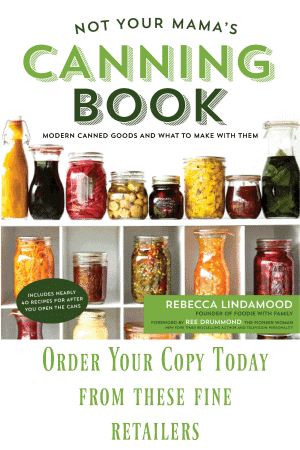 Aside from all of that, at no point in this post do I suggest this is home canning. It’s simply preservation courtesy of vinegar, sugar, and refrigeration; the original big three of home food preservation. How is prep time 10 minutes if you have to wait an hour with the salt and then A WEEK to serve?! It’s 10 minutes prep time because it only takes 10 minutes of hands on prep time. Resting time is not prepping time, necessarily. Have a nice day! So, I didn’t have any ginger with the fresh little pink parts even though I used my own freshly harvested ginger. I really wanted it to be that pretty pink color so I threw in a couple wild hibiscus pods. It really did the trick. Just finished the recipe, thanks!! The hibiscus pods are a brilliant hack, Su! What a great idea!